Your annual holiday should be a time spent relaxing, not worrying about how much it’ll all cost or if you’ve remembered to pack everything. That’s why we’ve created two handy tools to help you avoid these common holiday concerns. Planning is the key here. 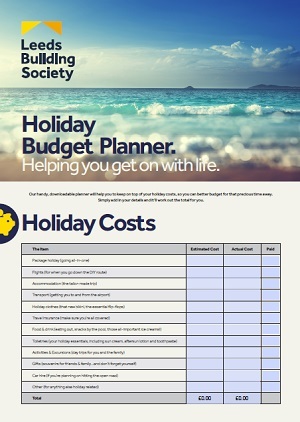 Make the most of our Holiday Hero & Holiday Budget planners and you'll not only have your holiday spend in check but you'll arrive with everything you need to have a great time. 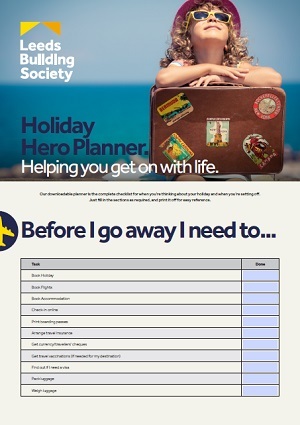 Use our downloadable Holiday Hero Planner to keep on top of tasks to do before you go away. Everything is covered, from checking-in online through to weighing your case to avoid any excess baggage fees. It also includes a holiday packing checklist. Use it and you won't be left without your essentials when you arrive at your destination. You might also want to take a look at our top 10 tips to make the most of your baggage allowance. You can save the planner to your computer and tick off the boxes as you go along or print it and stick it on your fridge for easy reference. In addition to the checklist, we have a downloadable planner which will help you keep on top of your holiday costs.This tool will allow you to better budget for that precious time away. Try to estimate the costs before you go as this will give you a good idea of how much money you will need to save for your trip. Once you return you can fill in the 'actual costs' column to see how your spending compared. Simply fill in your costs and it’ll work out the total for you. How can you really make the most of that well-earned time in the sun? We’ve compiled some top tips to help you have your best holiday yet.